Since I posted Part 1 of my crocheting story last year, I figured I should post part two this year that I typed up to put in my Record book (explanation in Part 1). I love doing this to see where I was a year ago, and how far I have come in a year! My favorite hobby has been the same for several years. That hobby – crocheting has taken me beyond my wildest dreams. If you read my Crocheting Story last year you would have heard all about the first year of the Block Party, how that birthed my mission trip to Ukraine, and about the beginnings of the adoption of my little brother Elijah. As well as how I was selling items to bring him home. I’m going to leave off from there and tell you about this past year. After an amazing benefit from our church raised all the money we needed to bring Elijah home, I decided to change my blog to Handiwork for Tori to raise money for another little girl who needed a family. After she got fully funded and found a family I changed my blog to Handiwork for Anastasia, but then Tori’s family decided to adopt her too! After that I went through Handiwork for Sergey, Handiwork for Eddie, Handiwork for Noah, Handiwork for Jonathan (my other new little brother), and Handiwork for Lilly, the current child. 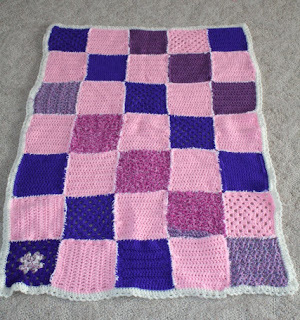 My friend Rachel has also been helping me crochet things to sell since Handiwork for Jonathan. 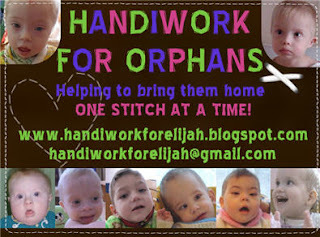 We sell most of our items on our blog – www.handiworkforelijah.blogspot.com, but we also do some craft sales. Above is our business card, with Elijah at the top right and going clockwise to the bottom right and across are all the children we have featured – Tori, Anastasia, Sergey, Eddie, Noah, Jonathan, and Lilly on the top left. I’m so grateful that God has given me the gift to crochet so I can help these precious children in this way!! Also thanks to the hobby of crocheting, this past year, I organized, with Rachel and my mother’s help, the second annual Block Party this past February. 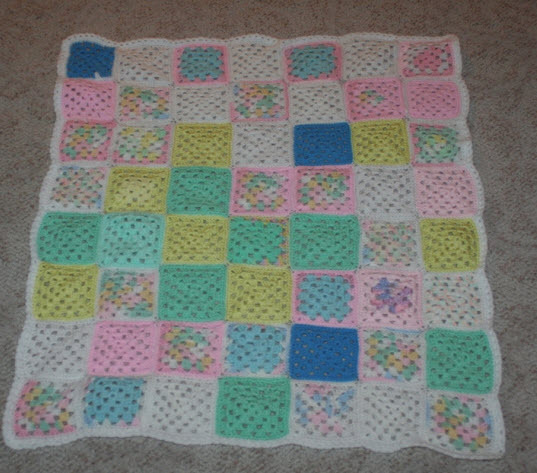 An explanation of the Block Party – I ask a bunch of knitters and crocheters to make 6 inch squares or blocks. Then on a Saturday morning, we get together and sew them together into blankets which we send over to Ukraine. In 2010, the first year, we had 308 blocks. This past year, my goal was to double that, and double we did!! We had a grand total of 659 blocks!!! 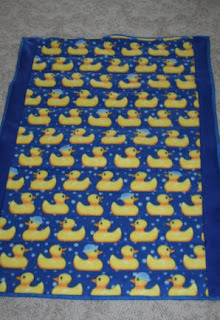 The 308 blocks of last year made 8 blankets and 2 scarves; and the 659 of this year made about 18 blankets! A group of quilters also made 20 more quilts, out of fabric, not yarn. In addition to that, we had lots of scarves, slippers, hats, and other items of the sort donated too! For this coming made about 18 blankets! A group of quilters also made 20 more quilts, out of fabric, not yarn. In addition to that, we had lots of scarves, slippers, hats, and other items of the sort donated too!